Us college students are often burdened with tons of school work, lack of time and, of course, our social obligation to party. These four (sometimes five) years have marked a period in people’s lives when refrigerators are primarily used to stock drinks and pantries sadly store endless supplies of ramen noodles or mac & cheese – the token caloric providers. Aware of these pressing circumstances, I wanted to come up with an hors d’oeuvre that would be practical for college students, yet fabulous for any swanky dinner party. The task presented endless challenges. For starters, I needed to find something that was trendy, classy and impressive, but was constricted by factors of taste, affordability and ease. Surely, these criteria sound contradictory, but a simple solution lay in Spain’s most brilliant culinary creation: tapas! Tortilla Española is a classic tapas served in bars and restaurants all over Spain. 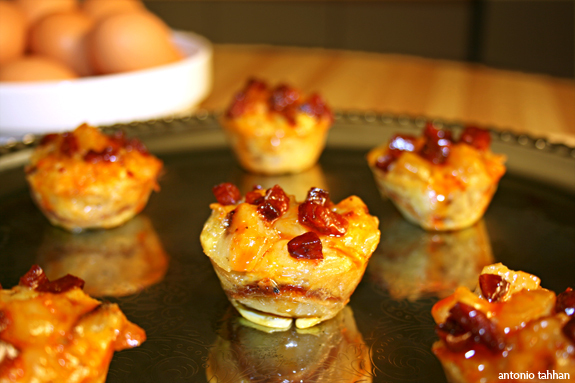 Fortunately, this version doesn’t require any fancy gadgets or expert techniques, just a mini muffin tin, potato, onion and eggs (chorizo is optional, but highly recommended). Halve the onions and then slice them into thin strips. Next, finely dice the potatoes. Coat a large non-stick sauté pan with olive oil and place over medium high heat. Add potato and onions, season with salt and pepper, and sweat the vegetables until tender (approximately 15-20 minutes). Note: Make sure to balance between heat and stirring so as to not get any color on the vegetables, but also not to over-stir so that the potatoes keep their shape. Whisk the eggs in a large mixing bowl. Add the cooked potato and onion mixture to the eggs and carefully spoon the mixture into greased mini muffin tins. Top each individual mini tortilla with diced chorizo and bake in a 400 degree oven for 7-9 minutes or until the tortillas have set. Posted in appetizers, recipe, savory, Spanish by Antonio Tahhan on October 14th, 2007. You can follow any responses to this entry through the RSS 2.0 feed. You can leave a response, or trackback from your own site. Delicious!! I made this for a Tapas party and It was a big hit! every one loved it.